When my IG friend, Lindsey asked me to join her style challenge this week, I was more than thrilled! @cleveland8284 and @talizat both hosted a challenge this week called #The5MustHaves and it was so much fun to participate in. I put some thought into what items are important to me for the Fall/Winter. Now that the challenge is over, lets review my picks for the week! The 5 Items you absolutely need in your wardrobe! I am completely obsessed with this trend this season! During Black Friday I bought 4 different Pom Pom Beanies from Old Navy, The Red Dress Boutique and ilymix.com. Pom Pom Beanie’s are fashionable and they keep your head warm. I linked a few Pom Pom Beanies that I am crazy for down below! A cozy Blanket Scarf will make winter so much more tolerable, especially when you are looking fabulous. Your winter wardrobe is not complete without a few cozy scarves in your closet. I got mine from Purple Peridot and ilymix.com. I am always on the search for affordable scarves. Over The Knee Boots will make your outfit sexier and the best part is, they will keep you warm adding that extra layer. You can style them with a dress, skirt or jeans. I bought mine over a year ago from the Red Dress Boutique and they were a great investment. Definitely something I need for winter. Actually, statement jewelry is great for all year round. I am a huge fan and I suggest you own a few pieces to make your outfits pop! Sometimes it is the accessories that really make the outfit! I shop at Purple Peridot and Bauble Bar for my statement accessories. In the near future, I plan on shopping other places as well. Off the Shoulder has been the trend and I have a feeling it’s going to stick around a bit longer. Winter calls for an off the shoulder sweater! They are so trendy and so warm. I bought the off the shoulder sweater at Miss Guided and I love it! My Miss Guided Off-the-shoulder sweater in blue. I decided to style it with some black booties and a thin black choker. I am also wearing one of my newest Bauble Bar Cosmic Drop earrings along with my pink Kate Spade purse for that pop of pink. If you decided to shop at ilymix.com use code cutebrandik20 so that you may get 20% off their cute accessories. 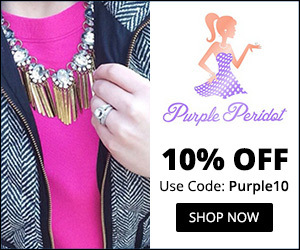 If you want to shop at Purple Peridot, use code Purle10 for 10% off your purchase. I just want to thank @cleveland8284 and @talizat for hosting this fun challenge- #The5MustHaves. Check out their IG accounts and give these sweet ladies a follow! What are your 5 Staple Must Haves? Love the off shoulder sweater. OTK boots, cozy scarves and a pom pom beanie are definitely some of must winter must haves as well. I love your pink purse too! That sweater is pretty. You always looking cute.